Spray 3 1/2-quart slow cooker with cooking spray. In medium bowl, mix flour, granulated sugar, 2 tablespoons cocoa, the baking powder and salt. Stir in almond milk, oil and vanilla until smooth (batter will be thick). Spread batter evenly in bottom of slow cooker. In small bowl, mix brown sugar and 1/4 cup cocoa. Stir in hot water until smooth. Pour evenly over batter in slow cooker. Cover; cook on High heat setting 2 hours to 2 hours 30 minutes or until toothpick inserted in center comes out clean. If possible, remove crock from slow cooker, and place on cooling rack. Otherwise, turn off slow cooker. Uncover; let cake stand uncovered 30 to 40 minutes to cool slightly before serving. Sauce will thicken as it cools. Spoon warm cake into dessert dishes. Spoon sauce over top. Serve with vegan frozen dessert and fresh berries. Look for vegan frozen dessert (such as vegan frozen ice cream) in the freezer section of your grocery store. Many are made using coconut milk and come in a variety of flavors. You can substitute regular unsweetened baking cocoa for the dark cocoa, but you will notice a substantial difference in color. Have a craving for a warm, decadent chocolate dessert? 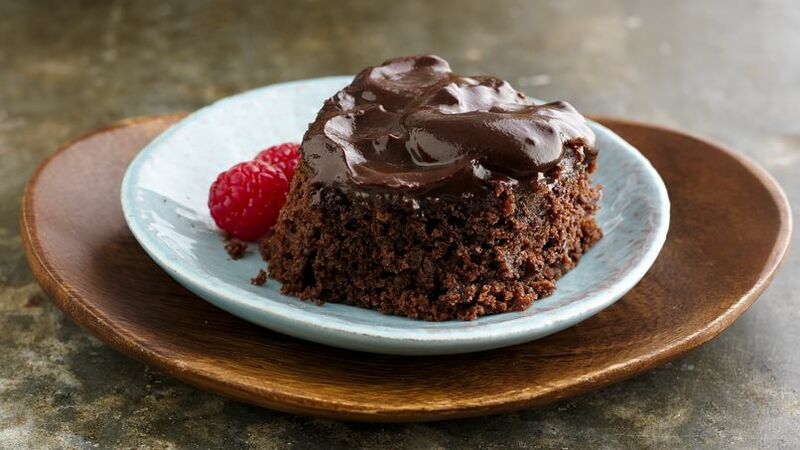 This vegan chocolate pudding cake will hit the spot.